Fatteh is a favourite of Levantine people in and outside Ramadan. 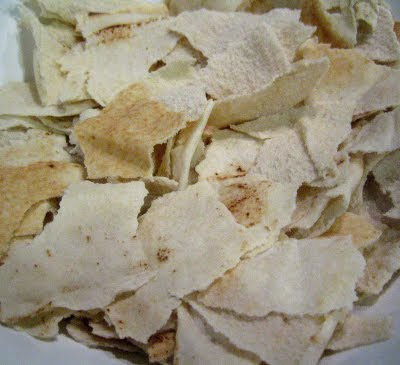 In its simplest form fatteh is shredded bread soaked in stock with some kind of topping. There are variations of Fatteh or similar bread based dishes all over the Middle East. In Ramadan, Fatteh is the perfect starter to the evening meal. It is soft and easy to eat on an empty stomach after a long day of starvation. Above all it is definitely delicious. In Syria, fatteh consists of three layers (sometime four, more on that later); Base of shredded bread soaked in stock, middle layer of the main ingredient and finally a youghrt and tahini sauce topping. Bread can be used fresh in some types of fatteh and fried in others. The middle layer could be one of many. Chickpeas, chicken, stuffed aubergines, kidneys are the most common roughly in that order. More exotic topping could include kidneys and trotters. Chicken fatteh is a Damascene favourite. Served as a supper dish in many restaurants around town especially in the Old City. Biet Jabri used to serve an excellent chicken fatteh. I hadn't had any there for many years so I can't comment on the standard these days. In Hama, chicken fatteh is served as a main dish rather than a starter. They fry the bread and add a fourth layer of cooked rice. When serving fatteh you need to assemble it at the absolute last minute, when people are actually on the table. It need to be eaten immediately as the bread start to become soggy and the whole thing turn stodgy if you leave it anything more than few minutes. So, get everything ready beforehand. One last thing before the recipe, please don't use Pitta bread for this dish. It will get very soggy. Please make the effort to find Arabic flat bread. It is sold in all the big Tesco stores and Middle Eastern shops. Serves four as a starter or two hungry people as a nice warm supper. Start by cooking the chicken and making your stock. Wash the chicken thighs, cover with water and bring to boil skimming the surface till totally clear. Add the onion and Salt and pepper, turn down the heat and let simmer slowly for 45 - 60 min. This will give tender cooked chicken and beautiful golden stock. I don't use carrot, celery or bouquet garni to make my stock if I am cooking Arabic food, instead I use literally two cloves and two cardamoms. When cooked, remove the chicken and let cool down. Strain your stock and return to very low heat till you are ready to use it. Remove the chicken meat from the bone and shred to bite size. Add youghurt, tahini, crushed garlic, squeeze of lemon and salt and mix together to make your topping. Add more or less tahini as you like. Now is the tricky bit, you may not get this right the first time or even if you make fatteh regularly you might still get one wrong every once in a while. The amount of stock varies on how fresh your bread is. The amounts I used (500mls stock and 3 standard size loafs) worked fine with fresh bread. If your bread is stalled or two days old you might need more stock as it will absorb more water. To make the dish put the bread and the chicken in a deep bowl. Add one third of the youghurt sauce and the stock and mix together. Spoon the rest of the youghrt topping and spread evenly on top. Garnish with parsley, roasted pine nuts and paprika and serve immediately. I am enjoying very much the Ramadan mode despite not fasting as you know. I wanted to tell you about a chicken fatteh dish I had the last time I was in Damascus, quite a la mode, and it was in a restaurant besides Umayyad Mosque called Laila's (Used to be Shahrazad in the old days I think). Well the point is, very untraditionally, they have made the bread, soaked it with the sauce, topped it with more sauce (no chicken so far) and only then topped it with thinly sliced, pan fried and quite spiced chicken breasts with the garnishing. I found it quite odd but it was delicious none the less. Two points I liked about it, first is that you see the chicken on top and it looked really good, it was pan fried with paprika, salt and pepper. The other is that I personally prefer fried or grilled or anything-else chicken to boiled one. The weak point in it I guess is that it wouldn't have been made in real chicken stock. Especially if I would make it at home, it will be done with Magi cubes or the similar. Thank you very much. This happens to be my favorite dish. I make it myself here, but I prefer chicken breast. Your post made me soooo hungry. That sound interesting. I would try to make it sometime. As a compromise and to get the best of both worlds take the breast meat of the bone and grill it. Use the bones, skins... etc to make the stock. Thank you very much, that is kind very kind of you. I am glad you enjoy the blog. I really hope you try this one, the concept, texture and taste is quite unusual for Western palate. Welcome to my blog. I used to make fatteh with chicken breasts but now I am totally converted. Thighs is the way to go! i've tried the hama version with rice and really loved it. i'll have to keep experimenting now i realise the different variations! welcome to my blog. I am glad you are enjoyinmg it and I hope yopu try this and all the other recipes. where did you try the Hama chicken fatteh? in Syria or somewhere else? You have an awesome blog, I really like it. Shame I didn't know it before. Welcome to my blog. I am glad you like the recipes and I hope you will try some of them at least. I am not a Chef! I have a full time job so cooking and this blog is my hobby and passion. I wish I can cook and publish something everyday but it is very time consuming so I have to publish every 5-7 days instead (and people will get bored if you write something everyday). Welcome again and Ramadan Kareem. Please do come back. Kano, i love the chicken combi- i make fatteh blahmeh but never thought to prepare it w chicken, which i know is quite a well known dish in damascus. your recipe is easy to follow. Try it and you will love it. Have you been to Damascus? Welcome to my blog. I am glad you like it. If you cook all the recipes I have published so far you will be an expert on Syrian cooking. You reminded me of Fatteh bzeit. It is one of my favourite dishes. It is not difficult at all to make but the ingredients are the problem. You need a not-very-good quality olive oil with a high acidity levels but I am sure it will be fine using normal olive oil. The main missing ingredient is something called "elli - قلي" this is some kind of a chemical material that emulsify olive oil and allow it to dissolve in water to form the characteristic milk-white liquid you use in the fatteh. I need to experiment a bit, may be this weekend, and if I get good results I will post a recipe soon. I just came from Damascus. It was my first trip to Syria, and I'm happy to inform you that Beit Jabri still serves an excellent chicken fatteh. I didn't know what it was when I ordered it, didn't know what it was when it was brought to the table - but when I tasted it, I absolutely immediately fell in love with it! And now I'm reading about it and the same restaurant on your blog. And you even provided me with the recipe!!! I am glad you liked the fatteh. I used to love the one they serve in Beit Jabri but I havn't been there in years. Now you need to make your own! 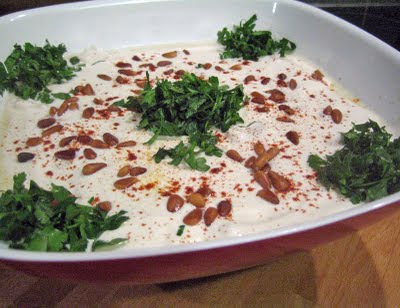 Hello, I am so glad to find a true chef at heart :0 can you help me make teseyeh soureyeh for breakfast? I will try to do teseyeh recipe as soon as I can. Did you use standard natural yoghurt? Ideally I will use Greek style yoghurt but due to wife orders we only have fat free natural yoghurt at home. So I used that instead. Works fine you might need to add a bit more lemon if the yoghurt is too sweet. Thank you very much for the nice words. I am so glad the recipe worked and you and the family liked it. The dish you are describing sounds like a fatteh variant. Fried bread and chickpeas are a common additions. I never heard of cooked yogurt in fatteh, though. Really sorry for the late reply. I completely missed you comment. By Pita, I mean the thick oval shape pita you find commonly in UK supermarket. Arabic flat bread is much thinner and larger. You need to buy it from Middle Eastern shops and occasionally in supermarkets. It is often referred to as Khobez or Khobz on the interenet. Hi there Kano, firstly, as this is my first post, I should thank you for posting these recipes, of which I have made quite a few! I studied in Syria the year before last for a year and miss the food incredibly. One question I have for you though is on this chicken fetteh: I found the best fetteh I had out there always had a very hot 'soup' component - when I tried heating the yoghurt in your recipe, it separated. Do you know how they made this hot, thinner soup without separating it? PS this chicken fetteh is overall one of the best things I have ever eaten! Thank you very much for posting and sorry for the late reply. You can't heat the yogurt. It will split. The only way to make the dish hotter by using boiling hot chicken stock. Also make sure your yogurt mix is at room temperature. Thanks Kano, I will try that. Also, looking through your site, I noticed that you too have visited the Shaalan fetteh place bouz al-jedi - that was the place I was thinking of and ate at every day! Thank you so much for posting your recipe! Chicken fatteh is my absolute favorite Lebanese dish -- I had no idea it was a Syrian dish as well (we get something very similar with fried bread & pomegranate garnish at a wonderful Lebanese restaurant in my parents' neighborhood), and was intrigued to learn about this variation. We don't go out to eat all that often, and I'm so pleased to be able to make this at home now. I made it yesterday, using rice instead of bread (gluten intolerant, grumble) and it came out soooo good. I will definitely serve it next time I have company. And I'm excited to explore your blog more and lean about other tasty Syrian dishes. Thank you again!